News from SteemSTEM - Join the team, use the app and support science! Thirty years and one day ago, the world-wide-web was invented. Consequently (good luck finding the correlation), today is the perfect day to share with you some updates about the SteemSTEM project. We have been pretty quiet these days but things are always moving on behind the scenes. We are happy to announce that besides very busy agendas, the steemstem.io development team has managed to build additional new features to our app steemstem.io. In particular, the currently deployed version 0.7 (and almost finalized) allows for a much better user experience: articles/comments can be posted and edited easily and straightforwardly, markdown is fully supported and post/comment editing works out of the box. With this in hand, we hope steemstem.io will become the best vector for enhancing interactions among all STEM users of the Steem blockchain. To motivate the usage of our app (and also to somehow call for additional beta-testers), SteemSTEM is already supporting any author using the app to post an article more strongly (with an automatic 5% stronger upvote). Starting today, the best comments posted from the app will also be rewarded. While spam comments will be automatically ignored, any other comment contributing to debates and interactions among SteemSTEM members will be upvoted with a strength varying between 2% and 5%. Whilst an algorithm pre-selecting the comments is already in place, the final voting will of course be manual. A special note to our honour members: as you are among the most engaged SteemSTEM members, you will get a slightly stronger upvote every time one of your steemstem.io posted comments is selected, as a bonus and a thank you for all that you bring to our community. SteemSTEM curation is a hard job. Not only does the SteemSTEM tag have to be scoured, but also all STEM-related tags like physics, chemistry, virus, biology and engineering. Curators read those posts, assess whether and how they should be voted, confirm the voting proposals of other curators and finally cast confirmed votes. In addition, our curation team is in charge of our distilled series and to support our various sub-communities. If you are interested in such a job, feel free to apply by commenting this post and letting us know, in 4-5 lines, why this job should be given to you. It should be made clear that this is a mostly voluntary position. Although we can provide a small 'less-than-a-coffee' tip each week and permit more voting flexibility for one's own posts (though, no self-voting), the main drive is not financial but inspirational; we at SteemSTEM are all part of a unique project supporting science and the Steem blockchain! 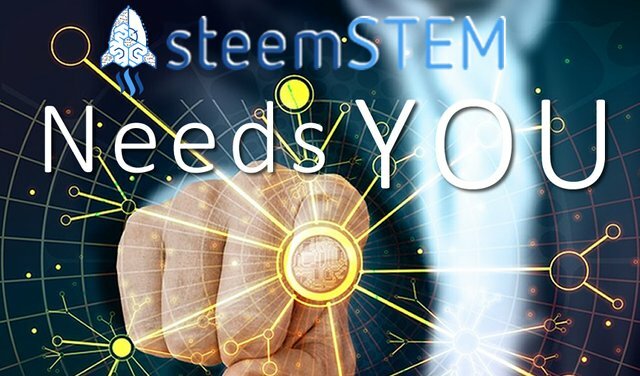 SteemSTEM aims to make Steem a better place for Science, Technology, Engineering and Mathematics (STEM) and to build a science communication platform on Steem. Make sure to follow SteemSTEM on steemstem.io, Steemit, Facebook, Twitter and Instagram to always be up-to-date on our latest news and ideas. Please also consider to support the project by supporting our witness (@stem.witness) or by delegating to @steemstem for a ROI of 65% of our curation rewards (quick delegation links: 50SP | 100SP | 500SP | 1000SP | 5000SP | 10000SP). I really salute the efforts of everyone that has been; directly and indirectly; behind the success of this community. It can only get better. I've been around for long, and I can say that SteemSTEM has grown and is still growing. I've realised that I've not the most active person on this platform lately, but I can certainly help to curate any article related to health and medicine. I'm willing to change my behaviour on Steemit and certainly would commit to evaluating articles which are within my expertise. We don't necessarily need constantly active curators, but we need consistently active curators, so if you think that's possible (harder than you think long term for the majority of us), lemme know! Although my word means nothing now, I can certainly try to be consistent. Can you drop me a DM on discord? its really an honor to be part of such an amazing community! hoping to see steemSTEM flourish further beyond. Thanks for updating us with the recent efforts from the team. Things are moving fast on the steem blockchain and it feels good to see that our dearest stem is not left behind. I am sure steemstem.io will be one of the best interface by the time it is fully ready. Loving what I'm seeing already. Kudos to everyone involved. sometimes I feel that many articles are not valued enough, thus many people leave. I want them to stay! Hey Chapperton, can you DM me on discord so we can discuss further? Hey there, thank you for your reply. Today it's my girlfriends b-day. I will contact you within the next days. Hi steemstem! I'm presenting my application here. I'm a great lover of nature and science, I spend a lot of time here on steemit and I have the opportunity to see many articles a day. We also have a small magazine @discovery-it dedicated to the world of science and history. Thanks again for your work! I've got not credentials or anything, at least none I'd be willing to verify with an identity. I also don't have very much SP at all to do curation with. What I do have is a passion for STEM, and I might say a fair bit of such knowledge if I were fooled into renouncing my humility. I'm also working on a personal software development project for Steem (there's your 'T' and maybe a splash of 'E' and 'M' to boot). While that will eat some Steem related time I might otherwise use to curate, it's a long term endeavor that motivates me toward consistent activity. Does @steemstem need people like me? Could you at least use someone like this? I'd be thrilled to help along such efforts, and zealous in my execution. Can you join our discord and grab me in DM? Will that be essential for this whole process? I'd rather avoid making even more new accounts with other services if I can. Pretty much everything we do functions on Discord, our entire curation system is built on bots that connect all our voting trails, blacklist and everything else seamlessly... so Discord, for now at least, is a must I'm afraid. Good luck to everyone applying for the curator positions! This sounds like a good opportunity for me to start trying to use the SteemSTEM dapp. I'm working on a post that I will try to publish with it in a few days. I'm still not having any luck getting it to work with my Firefox browser, but I guess that gives me a good reason to finally make the switch over to Brave. I have a small question about steemstem.io though: when I want to make titles, I'm used to use "##" to make them. However, on the Steemstem.io app this does not seem to work, at least not with the post preview. Is this a problem with the preview or is this not supported on the app? It seem to work fine with comment preview, but not with the post preview..
And does steemstem.io support some HTML? I usually align my images with < center >. Again, this seem to work for comment previews, but not for post previews. Sorry for the messy comment, but I really want to make sure my formatting is nice before I publish a post with the app. This is correct, markdown commands work but you must click the </> button to enable the editor mode first, and click again when finished with the post. If @valth does that, things should work for him. Ah, thanks! I didn't see the editor mode when I tried it out. I suppose that will fix all my problems. I see that you successfully got a post submitted with steemSTEM.io, any feedback you have about your experience would be really helpful. I don't really have a lot of feedback, since I type my posts in a text editor and just copy it over to the web interface. And it worked just fine once I figured out how to open the markdown editor. Well if you start using it more, please feel free to reach out with any thoughts you may have. Thanks, @mobbs. I totally missed the fact that I had to manually change it from a UI to a Markdown editor! You are probably right. It does not work well with Firefox at all. It seems to play nicely with Brave though. I do appreciate immensely, the brains and efforts behind the evolution of steemSTEM community in steem block chain. SteemSTEM has made the steem block-chain a solace for science and technology publishers; I testify of this from the time I have being around. I hope so too. I often see anti-vaccination propaganda on the blockchain, along with other pseudoscientific crap like flat-earth theories..
A big kudos to the entire steemstem management and members. They have all been doing a very great job in making the blockchain an eye-opener it is presently. Just like my colleagues have all said, it is growing and can only get better. Secondly, I'd like to apply for the role of a curator for physics and mathematics related articles. Well, I am convinced that I can do the job because I'm a graduate of engineering physics, and about to commence my MSc. in experimental solid state physics. I have a passion for reading science articles, both on steemstem and other international blogs and recognize quality which I'd like to bring to steemstem. Finally, I've actually partaken in such a similar role which was as a Quality control officer kind of, albeit on a temporary basis, for utopian courtesy of @suesa. So, I feel here's an opportunity for me to engage in it fulltime on steemSTEM. Hey there, I did try to message this before but I guess my slow internet issues (Steem is now blocked in China) frazzled my efforts. Can you message me on Discord, on the steemstem server or DM? Great to see this update, and great to see so many keen to curate! I sadly can’t make such a commit at the time being, but if you’re still looking for someone in a few months time I’d likely be up for this. I’m currently finishing up my PhD, but after that I’ve a large expanse of nothingness stretching out into the future, happy to fill it with this wonderful community for a while. Haha I've heard the same PhD story from a few people around this time. I'm sure we will still be searching to grow at any given time =D Good luck! Un gran trabajo de Benjamin en el desarrollo de la aplicación y que sea mucho más cómodo para todos los usuarios. Seguiremos trabajando para seguir fortaleciendo STEM. @steemstem You have received a 100% upvote from @intro.bot because this post did not use any bidbots and you have not used bidbots in the last 30 days! Great to see this update. I’m really excited about rewarding comments as that can really motivate the community to engage. Looks like a ton of applicatants for the curator position as well. I think I’d enjoy curating, but I don’t think I can be consistent enough at the moment. I tried downloading the app from playstore with an iphone 5c it didn't work, could it be as a result of the iOS or i'll have to get an Upgrade? Hey @mobbs, I saw your invitation for a #cn-stem curator today, and here is my application for that. Why do I apply for the #cn-stem curator? I agree with the mission of steemstem to make Steem one platform to help STEM and scientific research to be better in the universe, and I'm glad to make some contribution if I can. I love science, philosophy of science, engineering and technology and you can see from my profile @robertyan that most of my posts are about STEM, and tagged with #steemstem and #cn-stem. Why could I be qualified for #cn-stem curator? background: I have practical experience about academic research, and good knowledge about philosophy and history of science and technology, as I have written in this series 【未来教育学】成年人需要什么样的STEM教育？. And I have strong background about engineering and technology especially in computer science. community engagement: I have served as a bridge for discussion about #stem-art, and several questions in #cn-stem group. I started my life in Steem from Jan 2019, but already have good engagement with the CN community. curation experience: I also help the @team-cn group as a curator / editor of @cn-curation and @cn-activity, and work on a revision of Steem Guide e-book that help newbies to speed up with Steem. After much thinking on joining the curation team, I came to the conclusion that it would be so ungrateful of me if this distinguished community has being supporting me for long and I do nothing to help.